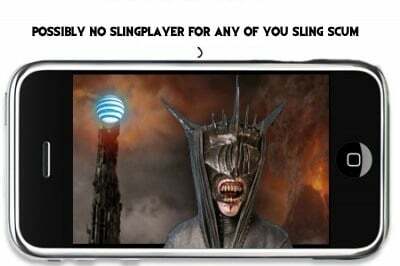 AT&T Alters TOS -- Kills SlingPlayer for iPhone Dead? When it rains it pours. Just the other day we reported that if you wanted to use the soon to be released(?!) SlingPlayer Mobile for iPhones you may have to upgrade your home SlingBox first. Not a wise move if you ask us, especially since it seems to be no reason but greed. Well now PublicKnowledge.org is reporting that AT&T last week went in and changed their TOS (Terms of Service). blockquote>This means, by way of example only, that checking email, surfing the Internet, downloading legally acquired songs, and/or visiting corporate intranets is permitted, but downloading movies using P2P file sharing services, customer initiated redirection of television or other video or audio signals via any technology from a fixed location to a mobile device, web broadcasting, and/or for the operation of servers, telemetry devices and/or Supervisory Control and Data Acquisition devices is prohibited.